These plush covers are a perfect accent to any nursery. 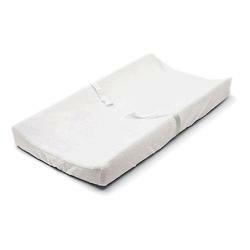 Our Ultra Plush™ covers are so soft to the touch and fit over most standard-sized changing pads. The velboa material is stain resistant and colorfast for long lasting use. Elastic bottom keeps the cover on the pad and buckle strap holes are available if needed.